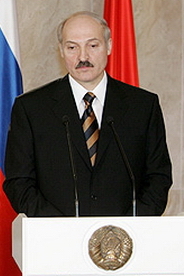 Alexander Lukashenko is the President of the country of Belarus. He has been the leader since 1994. He was the first leader of the country to be chosen by Belarus citizens. Before becoming the leader, he belonged to the law making section of the government. He was also in the military of the Soviet Union and ran a factory that made things to help farming. This page was last changed on 23 November 2015, at 05:22.